New Delhi— 1 September, 2018 — In their endeavor to increase support for elderly care, Wishes and Blessings, a Delhi-based NGO, organized a flash mob at DLF Promenade, Vasant Kunj, in association with Ramjas College and Institute of Home Economics. 50 students from two Delhi University colleges partnered with Wishes and Blessings to raise awareness and spread information on the current situation of the abandoned elderly of Delhi/NCR, and the need to give them the love and dignity of life they deserve. The performance was held at DLF Promenade on 1st September from 5pm to 7pm. Performers danced to popular retro Hindi music, in theme with the organization’s aim to increase awareness about love and care for the elderly. 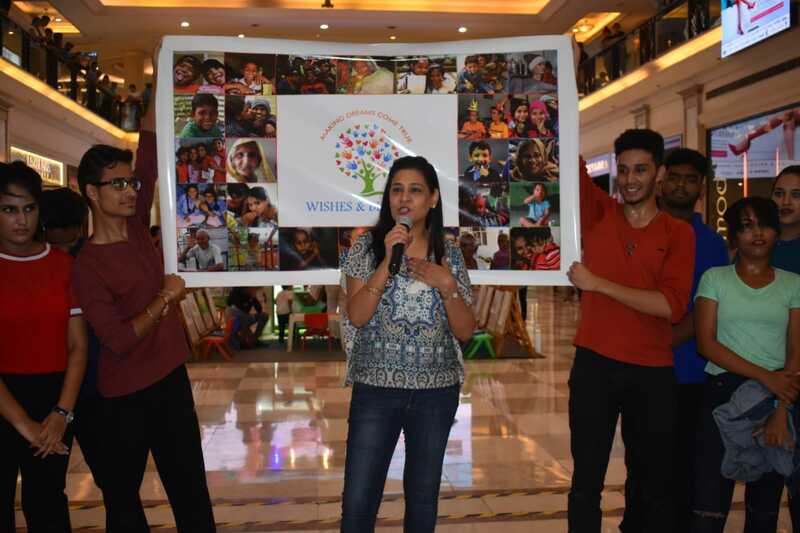 After the event, the organization’s founder officially started the countdown to the organization’s fourth charity pop up- WB ACT 4. Eminent personalities were seen at the flash mob, grooving to the tunes, and expressed their enthusiasm for the pop-up. Vendors and exhibitors from all over India are participating in ACT 4 and are showcasing their latest collections. WB ACT 4 is on 13th September, from 11 am to 8:30 pm at Royal Park, GK II. Wishes and Blessings is a registered NGO based in Delhi. Set up under the aegis of Dr. Geetanjali Chopra in 2014, the organization cuts across the spectrum of gender and age to help those who need it. The NGO is a unique platform to connect donors and beneficiaries, to bring together those who are blessed to help those who have unfulfilled wishes. They believe that happiness is not just an end, but a means to an end as well, and therefore do not have one focus area but 9 causes among which are skill development, infrastructure, education and hygienic food. Currently their focus area is the poor and elderly of Delhi/NCR. They are doing their part to counter this problem by building their first old age home. Called “Mann Ka Tilak”, the home was opened in April 2018 and aims to give the elderly the respect and dignity of life they deserve. This is part of their long-term project to build a chain of old age homes across India.